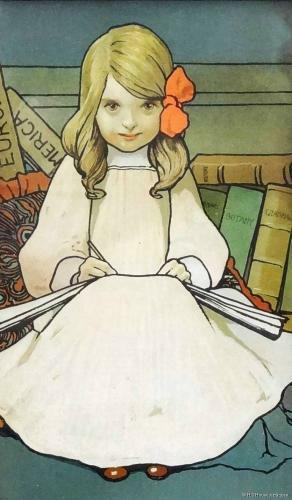 In 1898, Hassall designed a series of nursery posters and friezes for Liberty & Co, as did Cecil Aldin. Items such as these rarely survive, as they were originally designed to be applied onto the nursery walls directly. Examples of Hassall’s (and indeed those of Cecil Aldin) nursery friezes are held at the Museum of Domestic Design & Architecture (MODA) in Barnet, Hertfordshire. John Hassall was an extremely popular and successful artist/illustrator, having studied in Antwerp and at the Academie Julian. Whilst in Paris, he first encountered the work of great French poster artists, such as Alphonse Mucha and this was to have a great influence on his emerging style. He employed a thick dark line alongside clear bright colours, as can be seen in these friezes. It was a very bold and flat style that lent itself well for such designs and indeed for advertising, another area in which he excelled (e.g., the famous Jolly Fisherman in the iconic “Skegness is so Bracing” poster). He also illustrated numerous children’s books. He was a member of the the Royal Institute of Painters in Watercolour, the Royal Society of Miniature Painters and the famous London Sketch Club in Chelsea (he was President in 1903/04). He also opened the New Art School and School of Poster Design in Kensington in 1900. Later in his life (after WW1), he ran a successful Correspondence Art School.